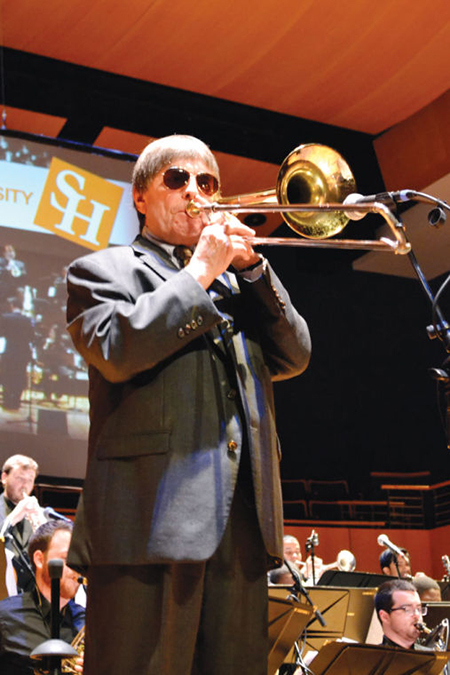 Two days of jazz will swing in full force on Friday and Saturday (March 27-28) as music talent from across the state takes to the James and Nancy Gaertner Performing Arts Center stage for the 57th annual SHSU Bill Watrous Jazz Festival. Hosted by Sam Houston State University School of Music, the oldest jazz festival in Texas will tune up at 9 a.m. with a showcase young Texas talent with a competition for middle school, high school and college jazz groups in back-to-back performances throughout the day. Although it is competitive, the festival is really about appreciating the jazz collaboration experience, according to SHSU’s director of jazz studies Aric Schneller. Schneller’s longtime friend and legendary jazz trombonist Bill Watrous not only lends his name to the event but also his talent by concluding each evening of the festival with a concert performance. Watrous said he also enjoys listening and supporting young musicians continuing the jazz tradition. "I am very impressed with what Aric and his students at SHSU are doing to foster jazz in Huntsville and the Houston region. It's an excellent program and an outstanding festival. I'm pleased to have this opportunity of a long-term relationship with Sam Houston State University," Watrous said. Competition performances throughout the two days are open to the public, with free admission. Each evening will conclude with a 7:30 p.m. finale concert featuring an awards ceremony and concert performance with jazz legends Watrous and Allen Vizzutti, as well as the SHSU Jazz Ensemble. Tickets to the evening concerts can be purchased for $15, or $5 for SHSU students and senior citizens, at 936.294.2339 or at shsu.edu/boxoffice.